The ANC itself dissociated itself from Smit, saying that she was not an employee of the party and was posting in her private capacity. Fair enough. Why, though, did ANC secretary general Gwede Mantashe pointedly decline to condemn and dissociate his party from the content of the post itself? Had it not been for the apparent ANC link, the post would most likely have been ignored, as Smit was just one of scores of South Africans who propagated similar material via social media and in the blogosphere. The latest outbreak of sustained hostilities between Israel and Gaza has resulted in a veritable tidal wave of shrill invective, not just against Israel but against the entire Jewish people. 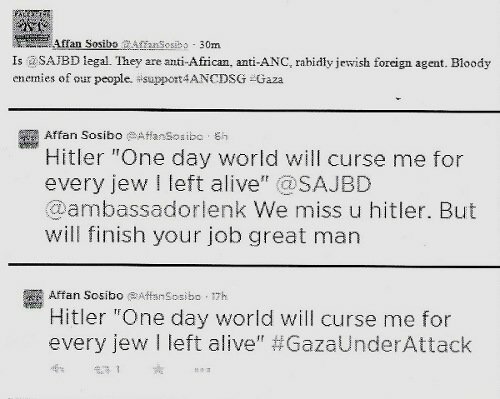 In my 17 years of monitoring anti-Jewish trends at the SA Jewish Board of Deputies, I have never seen anything like it. Another thing that has emerged very starkly from the innumerable incendiary exchanges over the internet is that the ever-fraught Israel-Palestinian question seems to set South Africans in general against one another’s throats more than any other issue. Alongside the many vicious anti-Jewish comments are malicious attacks against Muslims and Islam and exceedingly nasty racially loaded exchanges between blacks and whites. The manner in which the Middle East conflict is sowing division and poisoning relationships between fellow South Africans and the need to foster a more civilised discourse on the question is thoughtfully addressed by Marelise van der Merwe in the Daily Maverick. 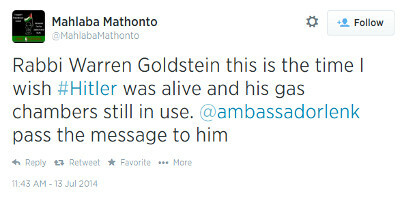 “Rabbi Warren Goldstein, this is the time I wish Hitler was alive and his gas chambers still in use” tweeted Mahlaba Mathonto to Israeli ambassador Arthur Lenk. The latter was directed to pass on the message to the Chief Rabbi. Responding to the question whether it was true that Israel was under a threat of terrorist attacks from Hamas or was rather exercising her authority under the protection of the US et al to commit genocide in Palestine, Thembelane Dibate wrote: “The latter is the right one. Hitler did right kill these cockroaches.” Dibate, by the way, is project coordinator at the Matthew Goniwe School of Leadership and Governance, which falls under the Gauteng department of education. Rachel @lakhilakhi5, of the Young Communist League of SA, has been especially busy. “Was Hitler Wrong about the jewish evil? Compare what’s happening today with the Holocaust and choose your name” she writes. She has also put out a version of what Rene Smit posted, with slightly different wording: “I would have killed All the jews.I saved sum 2show the world how evil they can be”. Somewhat puzzling is her tweet, “When Hitler the Great killed Jews, they ran All over the world Including back to Palestine!” One would not have expected her to acknowledge that Jews came from Palestine in the first place. Of the examples quoted above, it will be noted that most emanated by black South Africans. This, too, is something new. Up until very recently, hard-core anti-Semitic attitudes were all but unknown in the black community. At worst, one found the surfacing of the occasional “Jews are tight-fisted” stereotype. One practically never saw the kind of visceral, often overtly threatening hostility towards the Jewish community that is now commonplace. It all begs the question, why should a remote conflict taking place on another continent, one, moreover, whose destructive impact is demonstratively far less severe than many of those taking place in Africa itself, generate so much ill-feeling in this country? Why, also, has it generated such hatred against the Jewish people as to result in growing numbers of black South Africans enthusiastically embracing the Nazi ideology, even though this was almost as racist against people of colour as it was against Jews? All this is showing a face of South Africa that I never suspected existed. Right now, it’s hard to believe I’m living in the same country.